Here is my new Givre dress with contrasting yoke. It is close-fitting. Wearing such a close-fitting body-con dress is a bit intimidating, but having worn it around yesterday, I realized it can be quite liberating too. Yep, this is me, and I ain’t hiding it! 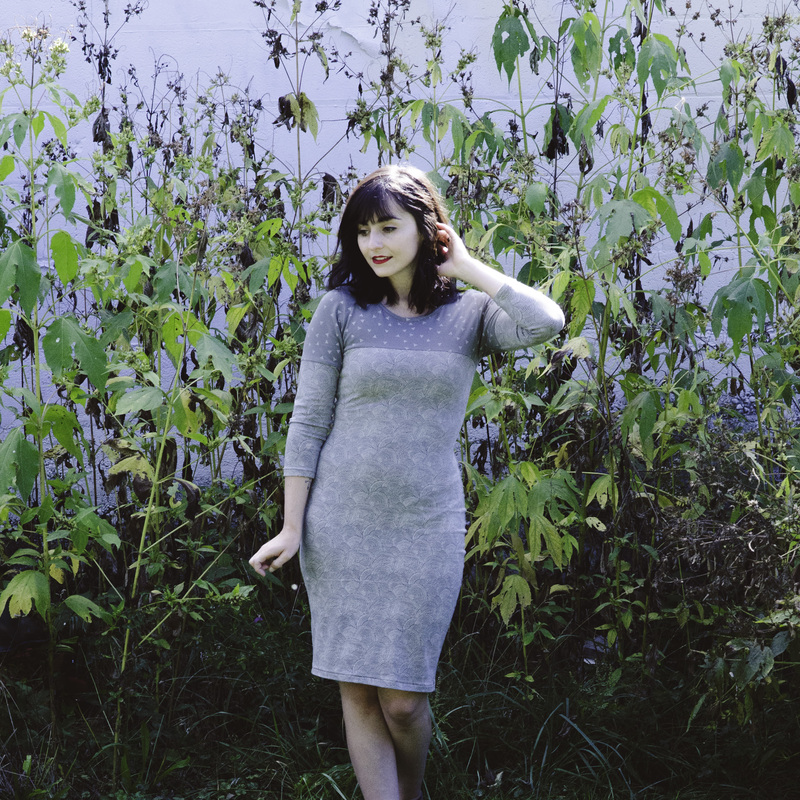 The two jersey knits that I used for this dress are from Dear Stella. “Scallop Dot Fossil” for the body of the dress and “Triangle Dot Fossil” for the yoke. I don’t usually mix prints but this one seemed quite obvious to me with the common dot element! I sewed 99% of this dress using my serger. Fun! I serged blind hems for the sleeves and the dress (note that I still have some work to do to achieve a real “blind” look), and I only used the regular sewing machine to attach the neckband. I’m so happy that I chose this Deer And Doe pattern to introduce me to sewing with knits. The instructions were very clear and the “sewing with knits” part of the booklet is super helpful! I cut a size 36 and made no alterations. I love the knee length and how it fits. The dress is comfy, flattering, and its 3/4 sleeves are perfect for the season. This Givre dress will see a lot of use over the coming months! Wow, it looks fabulous. Love the fabric and the fit. Ooo I’ve been looking at this pattern! But I’m intimidated by its super close for. I know exactly how you feel! I was intimidated too 😊 In the end, I find the fit quite flattering and the dress is just super comfy! Gorgeous! Try McCalls 6886 next. You will be addicted to sweater dresses. Thank you Carmen! That’s a great suggestion 😊 and I completely trust you on that, your versions of the McCalls 6886 are gorgeous! Lovely dress…looks gorgeous on you! Great job!